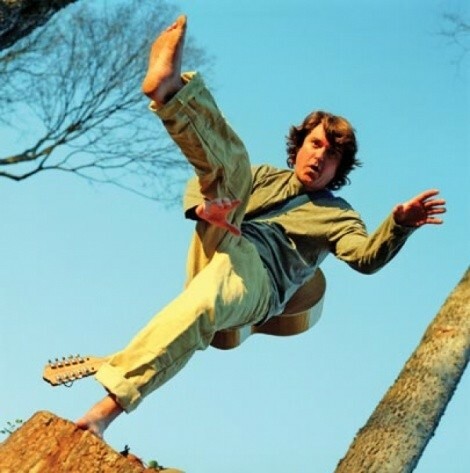 Let’s debunk a myth: Keller Williams is not a jam band. He has shared the stage with many jam bands—The String Cheese Incident, Umphrey’s McGee and RatDog—and he appeals to the jam-band audience, but it’s wrong and downright cruel to classify him in the jam-band genre. In Williams’ press kit, it is ardently expressed that his is not jam-band music. And there are at least three good reasons to argue in his defense. 1. He’s not a band. He’s a one-man show. He’s the lead singer, lead and rhythm guitarist, bassist, drummer and, for lack of a better descriptor, DJ. “I would say it’s a slight case of attention deficit disorder. I think that plays a large role in me drawing from so many different genres,” Williams says. 3. This is the clincher—he doesn’t noodle through long, ego-stroking guitar solos that are revved up through effects pedals. And his repertoire is devoid of 15-minute jams. He has the best people-watching view in the room night after night and uses it, although it’s hard to believe he has the time to while he’s busy controlling as many as five simultaneous tracks at a given time. He observes his audience intently, plays according to how they respond to him and sometimes makes fun of them. “My song ‘Freeker by the Speaker’ was actually made up just by noticing what’s going on in front of me in the audience,” he says. The song describes various people in the crowd, like the guy who dances as if possessed by demons, the raver girl sucking on a lollipop, the clean-cut boys leaning against a wall looking for a fight and so on. However, he desires to produce songs that people want to hear over and over again, and he recognizes the irony of the dualism. Each night, he’s grateful for song requests. “I don’t always play them all every show, but I do feel lucky having songs that they want to hear,” Williams says. “Ultimately, that’s kind of what everyone’s trying to do when they write a song—to make something up that outlives them,” he says. A Keller Williams live show is many things. It captures audience-requested gems alongside a mixed bag of other originals and some covers. It is a comedy act. It is seeing one man skillfully navigate multiple instruments and technologies to sound like a whole band. And that “band” is not a jam band. Sunday, Sept. 18, 7 p.m.